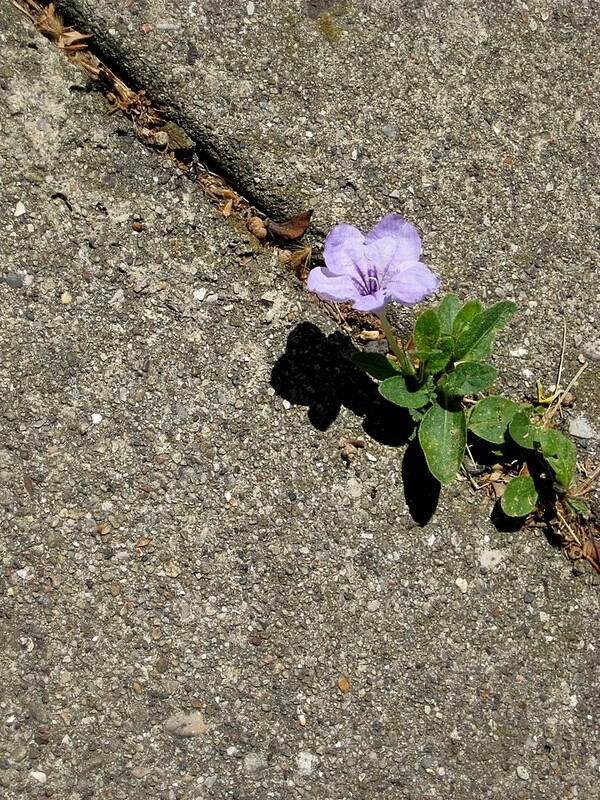 Weeds are plants that grow where you don’t want them, and plants growing in the cracks of sidewalks and driveways are frowned upon in polite society. The Wild Petunia in this photograph may be a weed in my neighbor’s sidewalk, but in mine it’s a symbol of the prairie clinging to a place where it once dominated the landscape. Wild Petunia (aka Hairy Petunia, Ruellia humilus – no relation to the familiar annual petunia) is a native to the Chicago region, occurring in places like gravely hillsides with with other short prairie plants. In landscapes, Muddy Boots uses it as a garden perennial in dry, sunny, non-irrigated micro-environments. It’s one of a handful of plants that I allow to self-seed all over the place in my own yard. It looks nice randomly inter-planted with Prairie Dropseed. 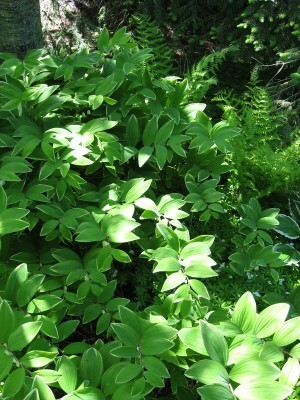 It even grows well in open shade, and looked spectacular during the hot, dry summer of 2012. This is one tough plant! Even the spotted spurge (the flat weed with the maroon spot in the center that seems to thrive on being driven over by your car) looks over admiringly from the adjacent sidewalk crack. Let me jump up on my soapbox in the town square and preach for a moment. I know, that looks like a bible in my hand, but if you look closely, it’s actually a similarly-sized book called Plants of the Chicago Region. Wild Petunia is a wonderful garden plant, but it’s never going to become popular because it doesn’t grow well in pots, at least not when it’s treated by nurseries like it’s a daylily. Even though it will thrive in a sidewalk crack, it will languish in a nursery. We try to buy a bunch of them in spring, so we can put the pots in a sunny spot and water them without getting water on the leaves. The foliage on the plants in the nurseries is hideous by mid-summer from the daily overhead watering, and they are pretty much unusable at that point. You wouldn’t us to plant them in this state in your garden, no matter how much we try to invoke the Cub’s motto – Wait Until Next Year.